This is the second version of the chameleon F Loop Plus, with a few very practical updates over the original model. 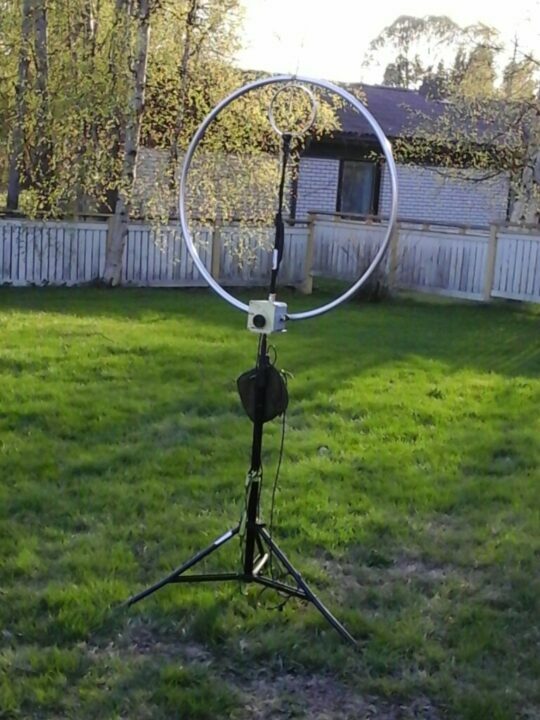 The Chameleon F-Loop 2.0 is a 40 through 10 meter magnetic loop antenna, with an 80/60m (included). It’s Unique in the way that it has hardpoints for an aluminum main loops, and coaxial main loops. Not only do these allow the operator to switch between various options, these hardpoints allow the operator to upgrade the F-LOOP main loop using eg Heliax, copper pipe, wider or a single aluminum main loop, … no other magnetic loop manufacturer offers this type of customisation option. Let’s look at the differences over the original F-LOOP. The pickup Loop supporting mast is now a telescopic type similar to the P-LOOP 2.0. This replaces the original hard line support tower, and in my opinion, is a much better solution. It also adapts to larger or smaller loop configurations. The aluminum main Loop is now two pieces where on my original model it was 3 unique sections. Loop Builders say this update cuts down on losses. I agree with that, but it makes the aluminum main Loop a little less portable. I think we can live with this. The base plate now has three mounting points. Two for traditional threaded quarter inch tripods, and one un-threaded 3/8. These mounting points give us most common mounting options for use with tripods, clamps, and custom brackets. The F-LOOP now has tuned pickup loops for the various main loop options. For example, if you’re using the coax main Loop you use the pick up loop tuned specifically for that. If you use the booster kit it also has its own custom tuned pickup Loop. The aluminum main Loop also has its own unique pick up Loop. There is a larger Dupont Delrin tuning dial to help make tuning easier and more precise. This is not an update but just a memorandum, the chameleon RTRR is also compatible with the F Loop 2.0. That means it can be remotely located and tuned with the RTRR. This is the original F-Loop playlist. These videos are still relevant to the F Loop 2.0.